Is there any way to make the font/color of the URL's more readable on the tan background in the settings of the forum? They look the same as regular text unless formatted and it sometimes causes unnecessary confusion. Yeah, I can see that the green can look like the text. Casey is kind of the LL design guru, so I'll see if he has any ideas. We can certainly do something. Is the green fine in the spots where it's bold? We could apply the bold in more places. Or would Brewerfan brick red work? It's not a Packer color, but we could call it "consistency" between the two boards. Any suggestions? We can do just about anything. I think a bolded green would be fine, the text is just not readily apparent it's a link when un-bolded. Is there a way to auto-bold URLs or something? I would think brick red could work too and would kinda/sorta match the color of the football print on the borders, but it's hard to tell without seeing it in action. Maybe it's too close to the tan-ish background. And I don't mean to be picky or anything, just trying to offer up some somewhat useful suggestions. (I guess it must be kinda hard, since all I did was just parrot your input ) Thanks for your help, Casey. I can change colors around, but I don't pretend to have taste. I've put up a couple of tests. 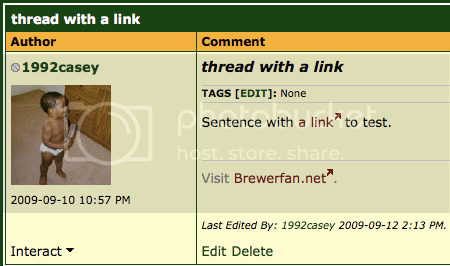 If you look at threads in this forum, all links are Brewerfan brick red. Threads in the IGT Forum have links that are bolded green. Here's an example. I didn't touch any topic lists, the main board page, or other forums. As I said, we can do practically anything anywhere. Good taste and visibility are our only limitations. Last edited by 1992casey on August 21, 2009, 1:06 PM, edited 1 time in total. I've added a third test. The College Football forum uses a mixture of both the current green (mostly bold) and Brewerfan brick red. Here's a sample of the combined colors. All of these samples miss a few links around the "edges," e.g. previous, next, etc. Any final decision would accommodate them one way or another. I'm digging the bolded green in the IGT forum, even if I'm just talking to myself there at this point . I've extended the bold sample to almost the entire IGT forum. The one notable exception is the ads. If we want those to be bold, they'd likely be easy enough to do, but I'd have to look up the instructions at Google. I remember that it was a snap to adjust the colors when they were first set up. My gut says that the bold currently extends into a couple of places where it might not be desirable, but I don't want to prejudice anyone by saying anything beyond that. Two thumbs on the bold from this color blind poster. I've removed the samples. Links within messages and signatures are now Brewerfan brick red (or football red), and a little arrow ( ) is placed behind them. The arrow has also been added at Brewerfan. Colorblindness is a huge issue on the web, and webmasters are often poor at taking it into account. It's one reason why some web purists feel that all links should be underlined no matter what, and it's also a reason why depending on color to convey meaning is a no-no. I believe the links that are still green contain text that makes it obvious that one should click. Let me know if there are still issues. Last edited by 1992casey on September 13, 2009, 2:39 AM, edited 1 time in total.